One of the core beliefs we have at CharacterStrong is that our actions should align first with our beliefs and values instead of just aligning to our emotions. To put differently, sometimes I just don’t feel like being kind...but that doesn’t mean I can’t choose it. Does that make the choice easy? Of course not. But is the choice to be kind possible even when we are feeling frustrated, angry, jealous, exhausted, stressed, or ______? Of course. It is a choice very connected to the social-emotional skill of Emotional Regulation (which, by the way, is closely aligned with long-term fulfillment and financial success in life). What choices do we make with regards to our Happiness? There is messaging in our culture that would suggest that we can simply “choose to be happy,” but at CharacterStrong we believe that happiness is the result of other choices, not the choice itself. Perhaps a better message to teach ourselves and the young people we serve is this: Happiness is the byproduct of an intentional focus on compassion and gratitude. We don’t find happiness - it finds us when we are doing the hard work to love others and ourselves. There are two powerful choices we can make every day that will bring more happiness into our lives. The first is to find opportunities to serve others. In giving kindness or working to support people who need help, we often get to experience the gratitude of others. The result of intentional kindness towards others can sometimes create responses like: “Wow, thanks for noticing! These are new shoes!” or “You totally just made my day.” or “I couldn’t of done this by myself - I appreciate your help.” Your actions just created gratitude in someone else. When other people tell share their gratitude for you, we experience the profound happiness of knowing we helped. It’s science! The other choice we can make to increase happiness is to practice gratitude ourselves. Writing down what you’re grateful for with consistency, taking a mindful minute in the morning to exercise gratitude for what is right in front of you, or meditating on what you have (instead of focusing on “lack”) are all proven ways to boost your mood. How cool is it that we don’t even need other people around for this one? 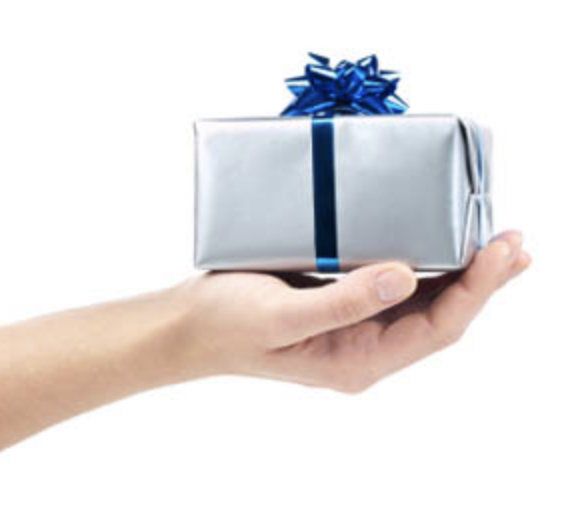 We can induce happiness simply by practicing internal gratefulness - that’s science, too! 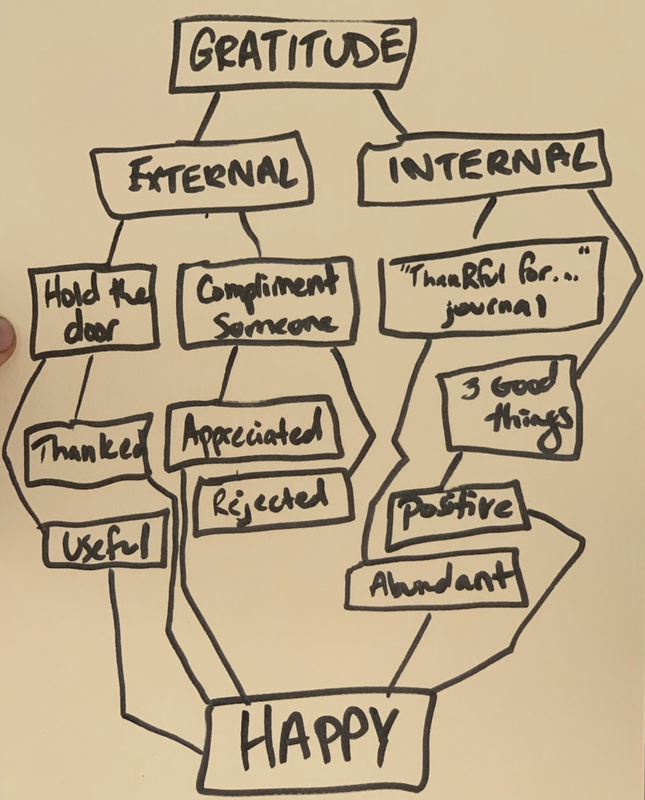 Start with the word Gratitude at the top of your new Happiness Flow Chart. Have participants help you brainstorm different paths that could be created from each. Talk about how External gratitude is created through acts of kindness or service and how Internal gratitude is created through self-reflection. What can these things look like? Draw a line to a few boxes under each with some of these ideas. Now, ask participants to describe the potential feelings or outcomes that happen as a result of these actions. Tell them the only word they can’t use is “Happy.” This can be an opportunity to talk about the potentials outcomes that don’t always feel good. For example, you can try to give a compliment to someone and could get laughed at or rejected or ignored! How do we respond in the face of those feelings? Finally, write Happiness in a big box at the bottom. Have participants direct you to draw lines from whatever outcomes or feelings from the row above might create or feel like happiness. Use this as a way to discuss that Happiness is not a pursuit itself, but a result of the purposeful, hard work of Gratitude! About the Author: Houston Kraft is the co-founder of CharacterStrong - an organization that provides curricula and trainings that help educators more effectively teach the Whole Child and create positive and safe school cultures. He has worked with over 600 schools or events internationally to develop communities of compassion and character. His work has been recognized by the Huffington Post and the Random Acts of Kindness Foundation. He is a speaker, curriculum developer, and kindness advocate.